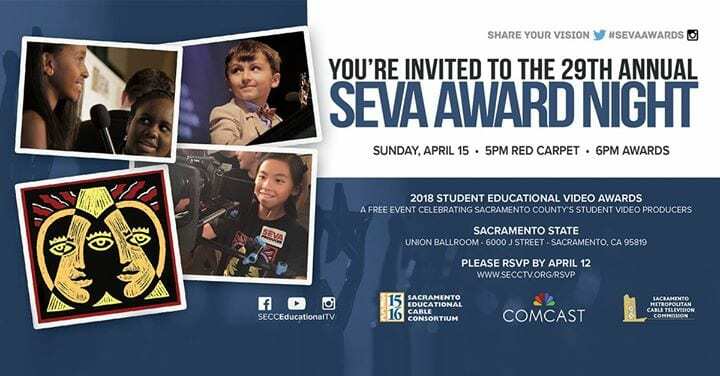 ELK GROVE, Calif. – April 20, 2018 – The Elk Grove Unified School District (EGUSD) proudly recognizes several EGUSD students who submitted their video works of art and were chosen to be among the 23 finalists competing for the coveted Student Educational Video Award (SEVA) organized by the Sacramento Educational Cable Consortium. Of the nearly 500 submissions to this year’s SEVA Awards, 10 EGUSD schools submitted more than 100 video projects. Six schools received Honorable Mentions and six proud groups of students in Oscar fashion thanked their families and friends and took home their prized SEVA Awards. The annual awards ceremony was held on Sunday, April 15, 2018 at Sacramento State University’s University Union Ballroom to celebrate the talents and visions of student video producers. The Sacramento Educational Cable Consortium’s (SECC) mission is to provide quality educational resources to learners of all ages in the greater Sacramento community primarily through video and other information and communication technologies via cable systems and networks. SECC is a collaborative effort of the K-20 education community all working together toward this mission.